MIDI (short for Musical Instrument Digital Interface) is a technical standard that describes a protocol, digital interface and connectors and allows a wide variety of electronic musical instruments, computers and other related devices to connect and communicate with one another. MIDI transmits messages to play notes and control data for parameters such as volume, cut off and tuning. These messages are sent to other devices where they control sound generation and other features. This data can also be recorded into a hardware or software device called a sequencer, which can be used to edit the data and to play it back at a later time. MIDI technology was standardized in 1983 by a panel of music industry representatives, and is maintained by the MIDI Manufacturers Association (MMA). Read more about MIDI on Wikipedia here. 1.) Your Android device should run at least Android 4.1. For good results, especially low latency and for MIDI Clock Sync use Android 4.2 or later. 2.) The phone or tablet needs to support USB host mode! Many, but not all devices support to connect USB devices through the micro USB connector. Please check the specifications of your device before buying any hardware, that later may not be useable with your phone or tablet. 3.) 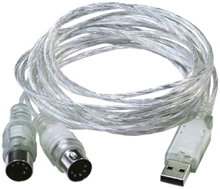 To connect any USB device to an USB host compliant device an USB Female to Micro USB Male OTG Cable Adapter is needed. They usually cost below $5. The adapter will convert the micro USB port to a standard USB port, where one can connect most USB hardware like a mouse, keyboard and also USB MIDI equipment. Most modern MIDI controllers can be connected directly through USB to your device but come with a standard USB connector. If the controller is USB MIDI compliant it will work out of the box and can be connected with the USB Host OTG cable to your phone or tablet. Check the power requirements of the MIDI controller, in case it is possible to power the MIDI controller with a power adapter it is better to do so to spare the battery of your Android device. Play and control RD4 - Groovebox with the Launchkey Mini, a compact MIDI keyboard and controller! Read more about the Launchkey Mini integration. The classic MIDI connector is the five-pin DIN connector. Most standalone MIDI keyboards, synthesizers and controllers come with such a connector. To connect to the classic MIDI connector a USB MIDI Compliant Interface is needed, one we can recommend is the ESI Midimate II (USB-MIDI Interface 2x MIDI). It comes with 2 five-pin DIN connectors which can be used as MIDI IN or OUT. It also has low power requirements, long cables and is fully USB MIDI compliant. RD4 can be used as a MIDI IN device, so one can connect it with the MIDI OUT port of your MIDI keyboard to play and control RD4 through your MIDI keyboard. RD4 supports MIDI clock, so it can be tempo synced to play along with your sequencer (like Ableton Live, Logic, Cubase). Also the controllers and notes can be remote controlled, for details which MIDI messages are supported please see the RD4 MIDI Implementation Chart. So if your audio interface of your PC or Mac has a MIDI OUT connector, as most professional Audio Interfaces do, RD4 can be connected to your sequencer. Consult the documentation of your sequencer software for details on how to setup and control external MIDI gear. For an overview which MIDI messages RD4 supports take a look at the RD4 MIDI Implementation Chart.